This giveaway is now over. See who won here. If you’re a parent or a teacher, you’ve read your share of children’s stories. But have you ever thought of writing your own children’s story? Cheerios is kicking off it’s annual Spoonfuls of Stories new author contest this month. One grand prize winner will receive a $5,000 cash prize for their original children’s story and a possible publishing deal with Simon & Shuster Children’s Publishing. In addition, the winner’s book will be featured inside specially-marked boxes of Cheerios cereal boxes. This spring, Laurie Isop’s book How Do You Hug a Porcupine? will be featured in more than 3 million specially-marked boxes of Cheerios and will be in bookstores nationwide this summer. If you’d like a shot at adding children’s book author to your resume, check out the Spoonful of Stories Contest from March 22 to July 15, 2011 to find out more. Enter to win a Spoonful of Stories Prize Pack! 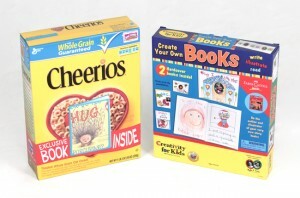 The Spoonful of Stories Prize Pack includes a box of Cheerios with Laurie Isop’s book inside, as well as a “Create-Your-Own Book” kit for kids that contains two hard cover books and all the materials need to creatively fill the pages inside. You’ll even get some story starter ideas and colored pencils to illustrate your story. This giveaway is open to all US residents ages 18 and older and will end at 9 p.m. CST on Thursday, May 5, 2011. Only one entry per person allowed. The information I collect in this giveaway will only be used to contact you if you are a winner and will never be shared or sold. Disclosure: Cheerios and MyBlogSpark provided me with a Spoonful of Stories prize pack as well as one to give away. Please read my full disclosure policy for more information.